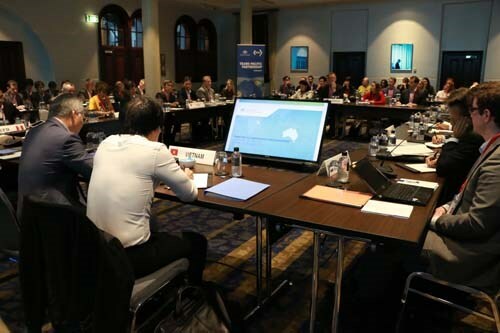 Sydney (VNA) – Deputy Minister of Industry and Trade Tran Quoc Khanh is leading a Vietnamese delegation to the Senior Officials’ Meeting (SOM) in Australia to secure the effect of the Trans-Pacific Partnership (TPP). Although there are a number of hurdles, Australia commits to joining hands with the remaining ten countries to make the agreement effective for mutual benefits of the participants, he stressed. Meanwhile, head of the Japanese delegation Kazuyoshi Umemoto said that the 11 countries need to promote solidarity so that the TPP can come into force soon. In the three-day meeting, the negotiators will discuss measures to amend the original TPP document in accordance with the new context. Once effective, the TPP will link 11 countries, including four of the world’s top 20 economies, with combined gross domestic product (GDP) of about 9.8 trillion USD. It would result in 19 new free trade agreements coming into force. The TPP was signed in February 2016 by Australia, Brunei, Canada, Chile, Japan, Malaysia, Mexico, New Zealand, Peru, Singapore, the United States and Vietnam.